Yiddish dialects are variants of the Yiddish language and are divided according to the region in Europe where each developed its distinctiveness. Linguistically, Yiddish should be divided in distinct Eastern and Western dialects. From Eastern Yiddish, Northeastern dialects were dominant in 20th-century Yiddish culture and academia, while Southern dialects of Yiddish are now the most commonly spoken, preserved by many Hasidic communities. Yiddish dialects are generally grouped into either Western Yiddish and Eastern Yiddish. Western Yiddish developed from the 10th century in Western Europe, in the region which was called Ashkenaz by Jews, while Eastern Yiddish developed its distinctive features in Eastern Europe after the movement of large numbers of Jews from western to central and eastern Europe. General references to the "Yiddish language" without qualification are normally taken to apply to Eastern Yiddish, unless the subject under consideration is Yiddish literature prior to the 19th century, in which case the focus is more likely to be on Western Yiddish. Western Yiddish included three dialects: Northwestern (spoken in Northern Germany and the Netherlands), Midwestern (spoken in central Germany), and Southwestern (spoken in southern Germany, France, and neighboring regions extending into Northern Italy). These have a number of clearly distinguished regional varieties, such as Judeo-Alsatian, plus many local subvarieties. The language traditionally spoken by the Jews of Alsace is Yédisch-Daïtsch or Judeo-Alsatian, originally a mixture of German, Hebrew and Aramaic idioms and virtually indistinguishable from mainstream Yiddish. From the 12th century onwards, due among other things to the influence of the nearby Rashi school, French linguistic elements aggregated as well, and from the 18th century onwards, some Polish elements due to immigrants blended into Yédisch-Daïtsch too. According to C. J. Hutterer (1969), "In western and central Europe the WY dialects must have died out within a short time during the period of reforms following the Enlightenment." Western Yiddish is no longer spoken natively. Eastern Yiddish is split into Northern and Southern dialects. 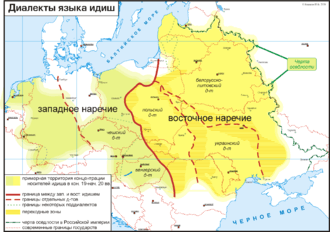 Northeastern Yiddish, also known as Litvish or Lithuanian Yiddish, was spoken in modern-day Lithuania, Belarus, Latvia, and portions of northeastern Poland, northern and eastern Ukraine, and western Russia. The Southern dialects are again subdivided: Mideastern or Polish Yiddish was spoken in Poland, western Galicia and much of Hungary, while Southeastern or Ukrainian Yiddish was spoken in Volhynia, Podolia, and Bessarabia (Romania). [nb 1] Ukrainian Yiddish was the basis for standard theater Yiddish, while Lithuanian Yiddish was the basis of standard literary and academic Yiddish. [nb 2] About three-quarters of contemporary Yiddish speakers speak Southern Yiddish varieties, the majority speaking Polish Yiddish. Most Hasidic communities use southern dialects, with the exception of Chabad which uses Litvish; many Chareidim in Jerusalem also preserve Litvish Yiddish. Jews from Udmurtia and the north of Tatarstan (the Udmurt Jewry, the Yiddish appellation is "dos udmurtishe yidntum") formed the local dialect on the base of the Yiddish of Udmurtia till the 1930s and features of Yiddish of migrants "joined" into it (in the 1930s and 1940s); as a result up to the 1970s and 1980s the Udmurt dialect (Udmurtish) was divided into two linguistic subgroups: the central subgroup (with centers Izhevsk, Sarapul and Votkinsk) and the southern subgroup (with centers Kambarka, Alnashi (see the rural Jewish community of Alnashsky District), Agryz and Naberezhnye Chelny). One of the characteristic features of the Udmurt dialect is a noticeable number of Udmurt and Tatar loan words. The primary differences between the contemporary dialects are in the quality of stressed vowels, though there are also differences in morphology, lexicon, and grammar. Northern dialects are more conservative in vowel quality, while southern dialects have preserved vowel quantity distinctions. Stressed vowels in the Yiddish dialects may be understood by considering their common origins in the Proto-Yiddish sound system. Yiddish linguistic scholarship uses a system developed by M. Weinreich (1960) to indicate the descendent diaphonemes of Proto-Yiddish (PY) stressed vowels. Each PY vowel is given a unique two-digit identifier, and its reflexes use this as a subscript, for example Southeastern o11 is the vowel /o/, descended from PY */a/. The first digit indicates PY quality (1-=*[a], 2-=*[e], 3-=*[i], 4-=*[o], 5-=*[u]) and the second refers to quantity or diphthongization (-1=short, -2=long, -3=short but lengthened early in the history of Yiddish, -4=diphthong, -5=special length only occurring in PY vowel 25). Vowels 23, 33, 43 and 53 have the same reflexes as 22, 32, 42 and 52 in all Yiddish dialects, though they developed distinct values in Middle High German; Katz (1978) argues that these should be collapsed with the -2 series, leaving only 13 in the -3 series. Litvish Yiddish has /ej/ for standard academic and literary /ɔj/ everywhere except for vowel 54. Some dialects have final consonant devoicing. Merger of /ʃ/ into /s/ was common in Litvish Yiddish in previous generations. This trait, known as Sabosdiker losn, was stigmatized and deliberately avoided by recent generations of Litvaks. As with many other languages with strong literary traditions, there was a more or less constant tendency toward the development of a neutral written form acceptable to the speakers of all dialects. In the early 20th century, for both cultural and political reasons, particular energy was focused on developing a modern Standard Yiddish. This contained elements from all three Eastern dialects but its phonetic attributes were predominantly based on Northeastern pronunciation. A separate article describes the resulting modern Standard Yiddish phonology, without detailing the phonetic variation among the three contributing dialects or the further distinctions among the myriad local varieties that they subsume. 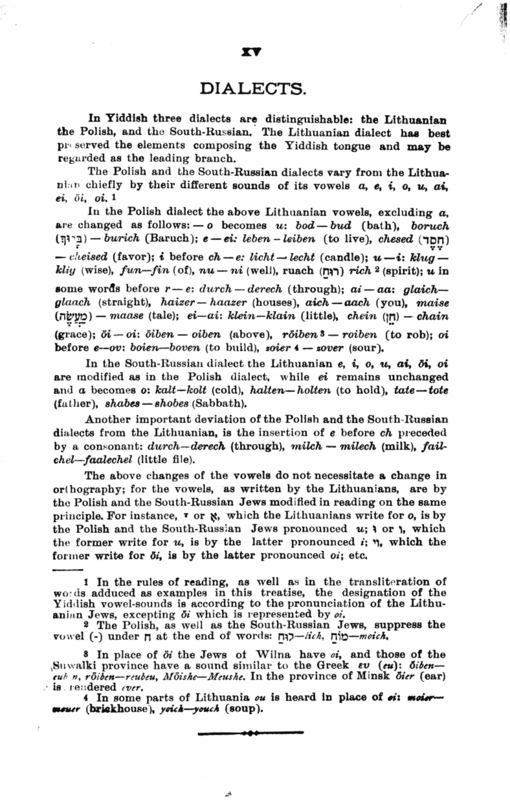 A useful early review of the differences between the three main Eastern dialects is provided by the Yiddish lexicographer Alexander Harkavy in a Treatise on Yiddish Reading, Orthography, and Dialectal Variations first published in 1898 together with his Yiddish-English Dictionary (Harkavy 1898). A scanned facsimile is available online. The relevant material is presented there under the heading Dialects. Harkavy, like others of the early standardizers, regards Litvish as the "leading branch". That assertion has, however, been questioned by many authors and remains the subject of keen controversy. YIVO, the Jewish Scientific Institute, is often seen as the initiating agent in giving phonetic preference to Litvish, but Harkavy's work predates YIVO's and he was not exclusively describing personal preference. A broad-based study provided in the Language and Cultural Atlas of Ashkenazic Jewry (discussed in detail below under the heading Documentation) provides a clearer picture of the more recent YIVO perspective. There is nothing unusual about heated debate over language planning and reform. Such normative initiatives are, however, frequently based on legislative authority – something which, with the exception of regulation in the Soviet Union, has never applied to Yiddish. It might therefore be expected that the controversy about the development of Standard Yiddish would be particularly intense. There is no standard pronunciation in Yiddish. However, the members and friends of the Yivo Institute for Jewish Research, New York, have strong views on the subject. They are convinced that Y should not differ in this respect from the great Western languages, and so they are willing to introduce a standard one. In their publications they speak as if it were already in existence, but this is wishful thinking – acceptance of their system being restricted to their circle. The original proponents of this 'standard' were speakers of the Northern dialect and so, without further ado and without discussing the matter or giving any reasons, they decided that their own pronunciation was the 'standard'. However, the man in the street knows nothing about it. If he happens to be a Southerner he does not exchange his rich phonemic system for the meagre one of the Northern dialect. He does not even know that this is 'supposed to be' the 'standard'. And if he is a Northerner, he goes on speaking as before, without realizing that he would need to change only one of his vowels in order to qualify as a speaker of the 'standard'. It is ironic that the partisans of the 'standard' – all convinced democrats – should ask the majority of Yiddish-speakers to switch over from their own pronunciation to that of a minority, comprising only a quarter of all Yiddish speakers. Recent criticism of modern Standard Yiddish is expressed by Michael Wex in several passages in Wex 2005. Regardless of any nuance that can be applied to the consideration of these arguments, it may be noted that modern Standard Yiddish is used by very few mother-tongue speakers and is not evoked by the vast bulk of Yiddish literature. It has, however, become a norm in present-day instruction of Yiddish as a foreign language and is therefore firmly established in any discourse about the development of that language. Between 1992 and 2000, YIVO published a three-volume Language and Cultural Atlas of Ashkenazic Jewry, commonly referred to as the LCAAJ. This provides a detailed description of the phonetic elements of what is presented as an Eastern-Western dialect continuum, and mapping their geographic distribution. A more recent extensive phonetic description, also of both Eastern and Western Yiddish, is given by Neil G. Jacobs in Jacobs 2005. ↑ Some authors use the term "Southeastern Yiddish" as a collective designation for both Poylish and Ukrainish while still applying the term Northeastern Yiddish to Litvish. ↑ The latter differs slightly from Lithuanian Yiddish in that many words with /oj/ in the standard have /ej/ in Lithuanian Yiddish, e.g. וואוין = Standard /vojn/, Lithuanian /vejn/. See Katz, Dovid (1087). Grammar of the Yiddish Language. Gerald Duckworth & Co. Ltd. p. 38. ISBN 0-7156-2161-0. ↑ Goldberg-Altyntsev A.V., "A short ethnographic overview of the Ashkenazic Jews' group in Alnashsky District of Udmurt Republic". Die Sammlung der wissenschaftlichen Arbeiten der jungen jüdischen Wissenschaftler. Herausgegeben von Artur Katz, Yumi Matsuda und Alexander Grinberg. München, Dachau, 2015. S. 51. ↑ Katz, Dovid (1087). Grammar of the Yiddish Language. Gerald Duckworth & Co. Ltd. p. 38. ISBN 0-7156-2161-0. ↑ Harkavy, Alexander. "Dialects". Treatise on Yiddish Reading, Orthography, and Dialectal Variations. Retrieved 11 May 2011. Birnbaum, Solomon A., Yiddish: A Survey and a Grammar, University of Toronto Press, Toronto, 1979, ISBN 0-8020-5382-3. Estraikh, Gennady, Soviet Yiddish: Language Planning and Linguistic Development, Clarendon Press, Oxford, 1999, ISBN 0-19-818479-4. Fishman, Joshua A. (ed. ), Never Say Die: A Thousand Years of Yiddish in Jewish Life and Letters, Mouton Publishers, The Hague, 1981, ISBN 90-279-7978-2. Harkavy, Alexander, Harkavy's English-Jewish and Jewish-English Dictionary, Hebrew Publishing Company, New York, 1898. Expanded 6th ed., 1910, scanned facsimile. Jacobs, Neil G. (2005). Yiddish: A Linguistic Introduction. Cambridge University Press. ISBN 0-521-77215-X. Katz, Dovid (1978). Genetic Notes on Netherlandic Yiddish Vocalism (PDF). Weinreich, Uriel, College Yiddish: an Introduction to the Yiddish language and to Jewish Life and Culture, 6th revised ed., YIVO Institute for Jewish Research, New York, 1999, ISBN 0-914512-26-9.